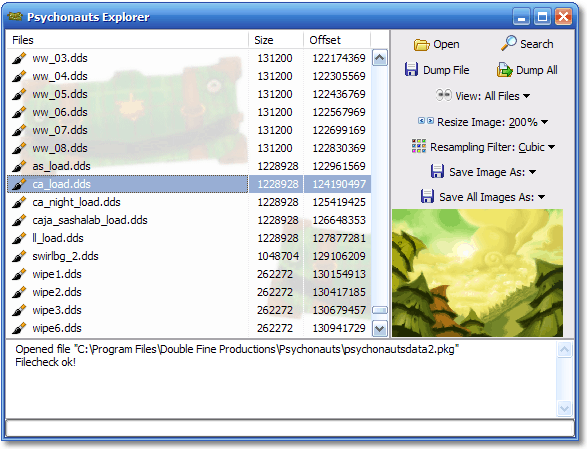 A program to extract, view and convert resources from the excellent game Psychonauts. Open and dump files from all Psychonauts archives. Save images as JPEG, BMP, PNG or DDS. Work with the PC, XBox and PS2 versions of Psychonauts. Update – this program is designed for the original version of Psychonauts. The re-released versions on GOG and Steam changed the file formats so some files (like the level .ppf files) wont work. I’ve added partial support for the re-release to Doublefine Explorer.